The episode begins with an amusing little scene, especially if you’ve ever discussed the series or the show on our forums. It then goes on to the aftermath of a battle—the battle budget is being saved for later in the season, we imagine—and introduces what appears to be a brand new character. Hmmm. In King’s Landing, the aforementioned scene leads to serious consequences for poor Sansa in a brutal, well-acted scene. This scene also sparks another, as Tyrion thinks of a way to improve his nephew’s outlook on life. Unfortunately, this particular scheme of Tyrion’s ends up having dire consequences. Across the sea, Daenerys finally gets some good news as Kovarro returns with word of a city called Qarth. However, once she and her “horde” arrives at its gates, she finds a rather more dubious welcome than she would have liked. Another new location in this episode is the massive, ruined castle of Harrenhal, destroyed by dragonfire during Aegon’s conquest of Westeros. 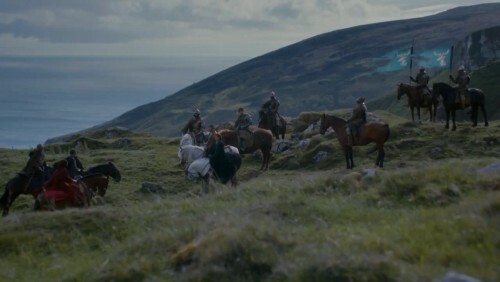 To this cheerful place Arya and her surviving companions are brought as prisoners and they soon get a taste of the gruesome hospitality of its current occupants. Arya starts making a very special list. Still in Renly’s camp, Catelyn receives an unwelcome visitor who brings a painful gift. This episode also features our first meeting between two of our many kings as Renly and Stannis meet for a parley. As one might guess from their respective personalities, it is far from an amicable encounter. As a result, Davos is given an assignment that sits poorly with the honourable old smuggler and the episode ends with a fantastic and very creepy scene.